The third tab in the TI-Nspire Computer Software Documents Toolbox is the TI-SmartView Emulator (or virtual keypad). You have a number of different ways to display the keypad (nine in TI-Nspire Student Software). 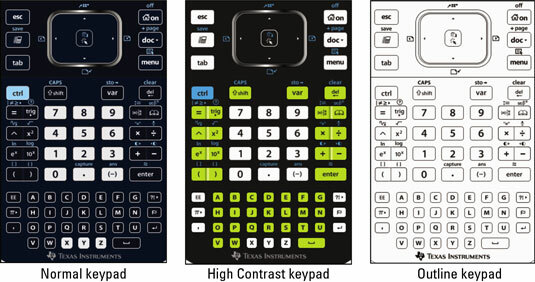 Using the drop-down menu near the top of the keypad, you can choose which calculator to display: TI-Nspire CX, TI-Nspire with Touchpad, or TI-Nspire with Clickpad. In addition, each keypad can be displayed in these three views: Normal, High Contrast, and Outline. Why would you want to use the keypad when all the tools are easily accessible? You have at least two reasons. If you learned TI-Nspire on the handheld, sometimes it is easier to find the command/symbol you are looking for by typing it on the keypad. To access this symbol on the virtual keypad, just click [CTRL][VAR]. To find this symbol without using the virtual keypad, choose Utilities→Symbols to open the Symbols palette. Scroll down to find the Store Variable operator and press Enter to paste it into your application. Teachers may choose to use the keypad for another reason. When you use TI-Nspire Teacher Software in class, have the keypad showing in the Documents Toolbox as a good visual aid, in case you want to point out the physical location of certain keys to students.